Flying towards the earth from an altitude of 10,000 feet may not be considered the norm, but it's sure to be an incredible buzz! When friends and loved ones question your sanity, you can reassure them you're in safe hands as you'll be strapped (literally) to a full qualified instructor throughout the jump. 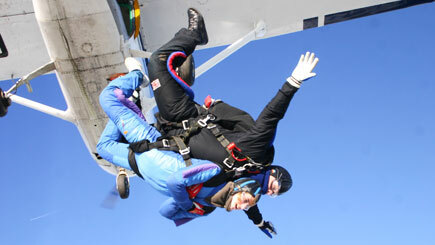 The session begins with around an hour of instruction on skydiving and landing methods before you board the plane. Once secured to your instructor and after a few deep breaths, you'll jump from the plane, experiencing a jaw-dropping freefall for 30 seconds. The instructor will then open the parachute and you'll both slowly descend to firm ground whilst admiring the scenery and coming to terms with the adrenaline rush.